Okay, I'm starting to miss cooking. Think I can get my act together to cook a meal this week? Maybe I should make that my goal this week (in addition to the usual one of not dropping the baby). This week's Roundup has a bunch of my favorite posts - recipe reviews. They are the whole reason I started the Roundup in the first place. 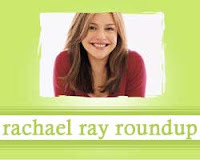 According to the local paper, Rachael Ray returned to her alma mater once again for a charity event. Mary Ann of Meet Me in the Kitchen tried Brownie Bites from Every Day with Rachael Ray. Leah Remini used her blog to update us on getting her daughter Sofia off of bottles. Cate at Sweetnicks made her family very happy when she made Rachael's recipe for Peruvian-Style Fried Rice. Kristen Doyle at Paper Palate tested Rachael Ray's Tex-Mex Corn Chip Chili from the March 2008 issue of Every Day with Rachael Ray. Karen of Busy Mamas tried Linguine with Bacon & Onions from Every Day with Rachael Ray. Cate at Sweetnicks tried the very interesting sounding Bacon-Avocado Griddle Pizza. You know me - I'm an over achiever.